Providing a survey of colonial American history both regionally broad and "Atlantic" in coverage, Converging Worlds presents the most recent research in an accessible manner for undergraduate students. 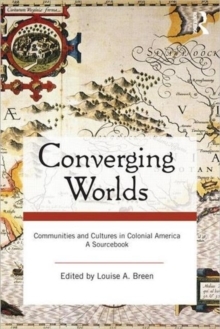 The ideal accompaniment to Converging Worlds: Communities and Cultures in Colonial America, this Sourcebook is a collection of primary documents that contextualize and bring to life the exciting narrative of early America. The expert authors of each chapter have hand-picked multiple documents corresponding with the same chapter in the textbook to help students delve deeper into the diverse geographic regions and variety of topics covered in this time period, including: Letters Pamphlets and newspaper articlesExcerpts from diariesPatents and chartersCourt recordsAnd much more!While the Sourcebook and text make a perfectly integrated package, the Sourcebook also features general introductions and section introductions framing the documents, so students can easily use it on its own to explore the vast colonial world up close. In addition to the helpful maps, timelines, and further resources available for students on the companion site, instructors will have access to the full text of many of the documents included in the Sourcebook. For additional information and classroom resources please visit the Converging Worlds companion website at www.routledge.com/cw/breen.